KYOTO - When Go Suzuki dances, he dances like no other, his wheelchair glides across the floor, his arms spread with dramatic flair as he spins in beautifully sequenced, perfectly timed choreography with his partner’s steps. His wheelchair is no longer a tool but an expression of art, and he intends to keep it that way. “In the past, when we started dancing, people praised us more out of pity, looking at our dancing as one performed by someone with a disability. . . . I disliked that,” Suzuki said in a recent interview after his group, based in the city of Osaka, performed in neighboring Kyoto. Seven members of the group were the opening act in one of the cultural sessions titled “Building the Future through Cultural and Artistic Resources,” at the government-hosted World Forum on Sport and Culture in Kyoto, the nation’s cultural center. “Of course we are disabled but I did not want people to link our dancing to disability,” said the 42-year-old director of Genesis of Entertainment, a civic group formed in 1997 to offer activities, centering on wheelchair dancing, for both disabled and able-bodied people. 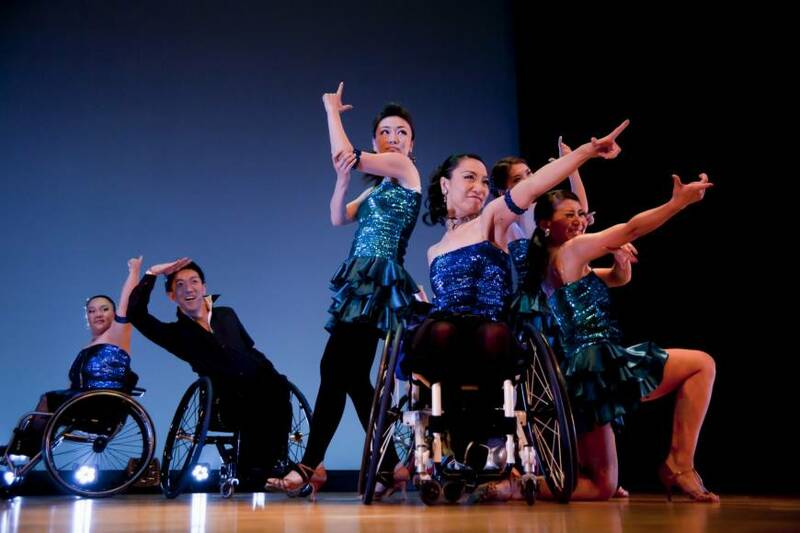 “When people watch us dance, we hope people appreciate our performance for what it is — an art,” said Suzuki who was left needing a wheelchair after a motorcycle accident. With the goal of promoting Japanese culture to the world and increasing momentum for the 2020 Tokyo Olympics and Paralympics, the Kyoto session of the forum that took place earlier this month featured a series of talks and performances highlighting Japanese culture. Japan has been stepping up efforts to use the 2020 Tokyo Games as a cultural festival, as described by government officials, to highlight the role of sports and culture in connecting people. 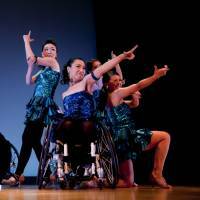 Genesis of Entertainment aims to make wheelchair dancing a job, giving people with disabilities a way to use their creative talents and skills to earn a living. As public awareness about Paralympic sports heightens, especially ahead of the 2020 Tokyo Games, those involved have seen a spillover into the arts. But Suzuki acknowledges the challenge faced by people with disabilities trying to make a living only through dance. In June, his group performed at the office of Prime Minister Shinzo Abe during an event showcasing artistic performances and activities of people with disabilities, as part of the government’s efforts to create a more inclusive Japan in which every citizen can play an active role in society. A total of 60 people have joined Genesis of Entertainment, ranging from teenagers to those in their 70s, and Suzuki is one of the core members who regularly perform in Osaka, and elsewhere. During the group’s performance at the forum in Kyoto, they danced ballroom style, what they say is their forte, and included music played by shamisen, the traditional three-stringed musical instrument. Suzuki said he eventually wants to incorporate more expressive contemporary dancing and to sharpen their dancing skills. Looking ahead, he has high hopes for the group to perform elsewhere in Asia, possibly South Korea and Taiwan. Individually, Suzuki and other members have traveled abroad to compete in events such as the IPC Wheelchair Dance Sport World Championships, but together their group has yet to perform overseas. In aiming for the global stage, Suzuki said members must improve their craft, and by doing so his hope is that the public will appreciate them as artists in their own right. But first the group must demonstrate that wheelchair dancing has intrinsic value, and that it is not simply people with physical impairments doing their best. Suzuki knows his group has to work doubly hard for society to take them seriously as artists. “Technique, technique, technique. I focused on honing my skills and practiced like my life depended on it,” he recounted. His hard work paid off eventually as he gained recognition around 10 years ago. Suzuki said their performances are a delicate blend of timing and balance in moving their wheelchairs and being in sync with their partners, but it is no easy feat. Mika Ikeo, a 29-year-old who dances as a “standing partner,” believes in the potential of the wheelchair as an asset to enliven a performance. “The focus is on what cannot be done, but we want to send a message instead that we are able to give this kind of performance precisely because of the wheelchair,” Ikeo said. The popularity of wheelchair dancing — both as a combined style involving an able-bodied partner and a wheelchair user, and as a duo of wheelchair users — has grown since the late 1960s. Suzuki said there is an aspect of wheelchair dancing where it is viewed as a sport; he wants to focus on its artistic side. Nana Okamoto, one of the group’s younger members, was enthralled by one of Suzuki’s performances when he visited her elementary school as part of a program aimed at educating students about wheelchair dance and the experiences of people with disabilities. Okamoto described Suzuki’s dancing as cool and said he inspired her to take up wheelchair dancing. Now 17, the high school student she said she wants to share what she has learned from dance. “I hope that wherever we go, regardless of where one is from, regardless of whether one has disability, our dancing can inspire everyone to start something new,” she said.